Between St George's Day and the end of June I unashamedly indulge myself with English asparagus. To my mind, there are few things more wonderful than the pert green spears. If you feel similarly, or want to see what all the fuss is about, then read on, as I've decided to share some of my favourite asparagus recipes. 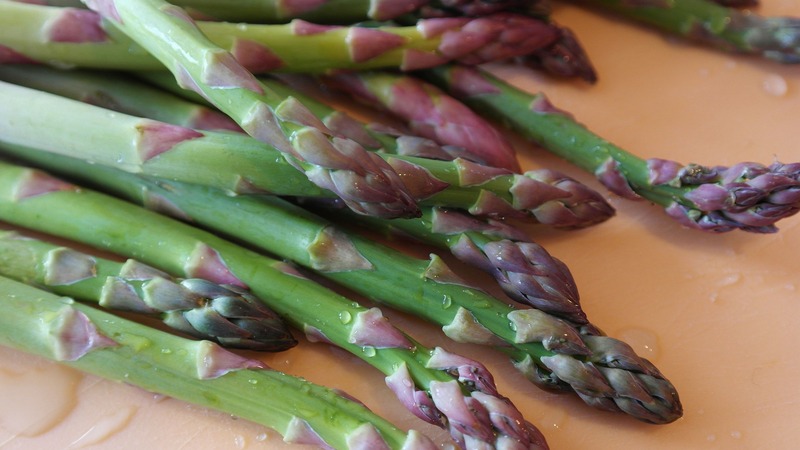 I can eat asparagus in any form and have collected and tried numerous recipes over the years. 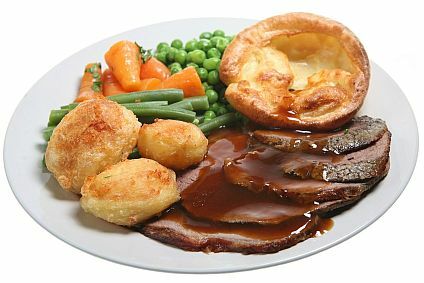 It's great by itself, of course, lightly steamed with Hollandaise Sauce. But you can also griddle it, grill it, roast it or bake it in a creamy cheese sauce. 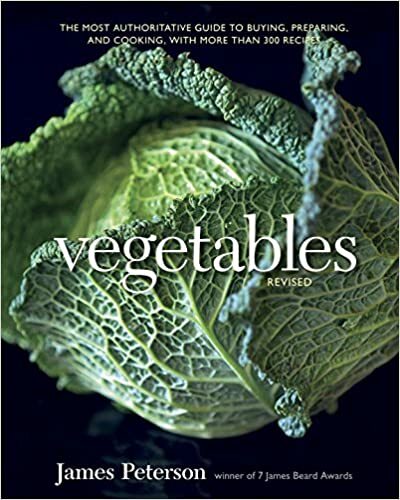 You can add it to a salad with egg and new potatoes, or partner it with tiny broad beans and goats cheese, fling it into soup, stir it into scrambled eggs or stretch it out alongside a piece of steamed salmon or cod. In every case, you'll have a meal to remember. And when the short season is over? Wait for next year and collect more asparagus recipes while you do so. Imported asparagus simply has nothing on the taste of the home grown one, and that's a fact. This is my husband's favourite way of cooking asparagus and - apart from the recipe above - I would not even argue. You need a griddle pan, lots of asparagus and a little olive oil. Get the griddle pan very hot. Snap the wooden ends of the asparagus spears. Rub the oil over the asparagus spears, then place them on the hot griddle. Cook until bright green and a little charred in places. Sprinkle with coarse sea salt and serve with garlic mayonnaise or with a drizzle of balsamic vinegar and parmesan shavings. 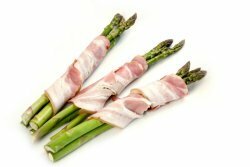 Asparagus and bacon is a very classy-looking dinner party starter and great if you want to try something different with your haul of asparagus. Simply prepare the spears for cooking, then wrap small bundles of three spears in strips of smoky bacon. Place the bundles on a baking tray and brush lightly with olive oil or butter. Bake in a medium oven for 7-10 minutes until the bacon is crisp and the asparagus tender. Serve with parmesan shavings. This is one of those asparagus recipes that's pure indulgence. Try at least once, but not when you're on a diet! 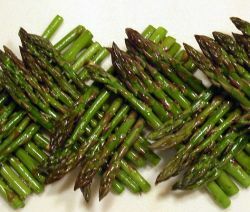 Heat the oven to medium and place your prepared asparagus into a shallow, ovenproof dish. Season a pot of double cream with salt, pepper and a little crushed garlic. Pour the cream over the asparagus to almost cover the spears. If you like, sprinkle with grated cheese. Gouda, parmesan or gruyere are all good. Bake in the oven until the asparagus is tender, but still with a little bite, the cream is bubbling and the cheese melted and golden. Serve with new potatoes and a green salad for the ultimate supper. 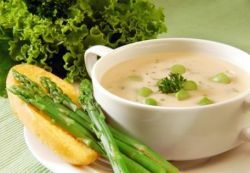 Cream of asparagus soup is a bit of a cliche, and while it's comforting, there's a clear soup amongst my asparagus recipes that I find brings out the flavour of fresh asparagus much better. You need 1-2 litres of really good,tasty stock, chicken or vegetable stock make a great base. Bring this to the boil, then add 1 diced carrot, 250g diced asparagus and 250g green peas, fresh or frozen. 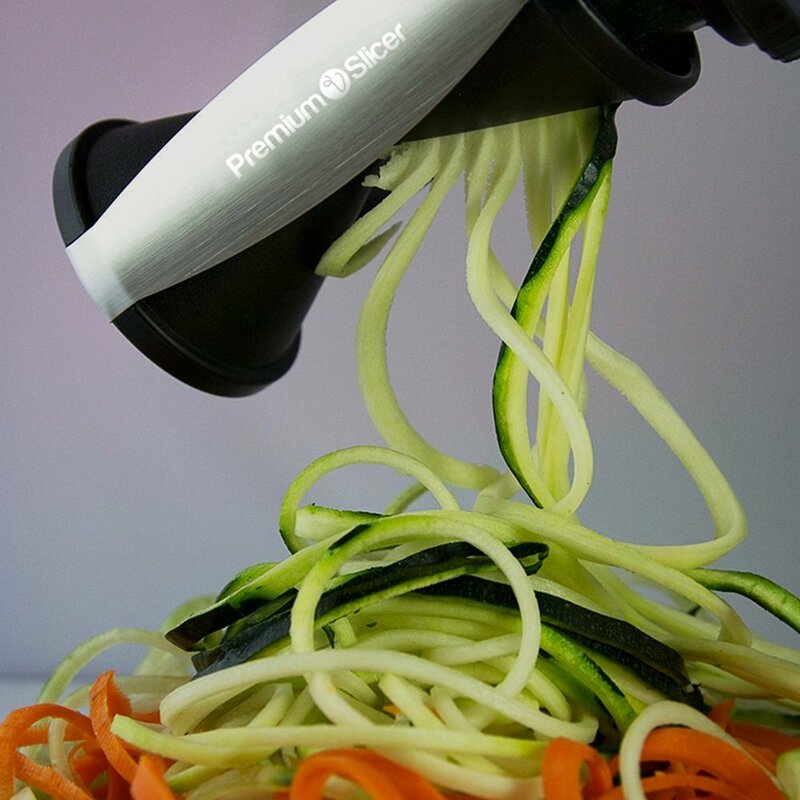 Cook for just long enough to tenderise the vegetables, then take off the heat. Serve with a handful of chopped fresh parsley sprinkled over the top. I probably have more asparagus recipes than there are days in the asparagus season each year, but it does not deter me to seek out new ones. 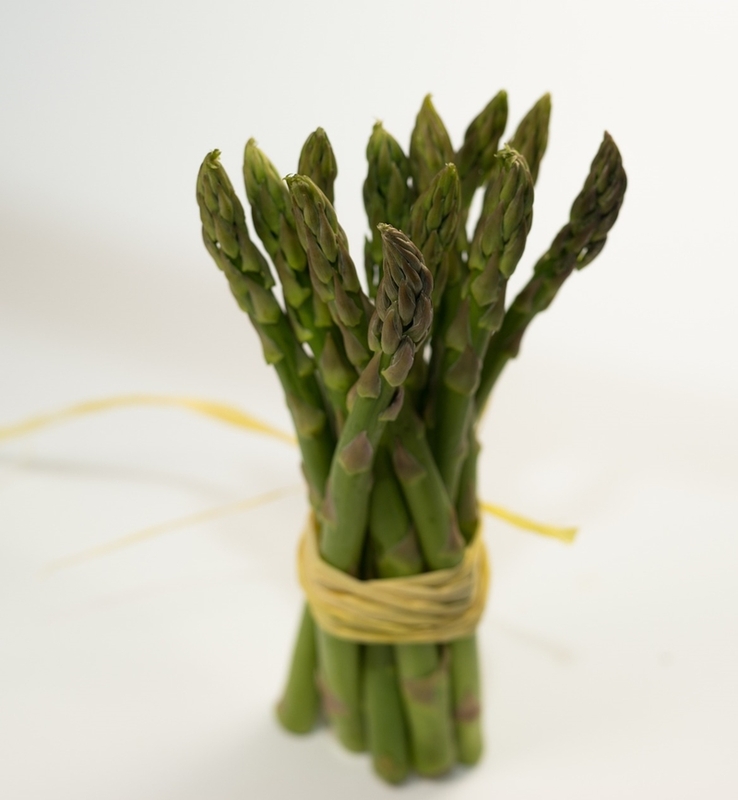 Still, there are some things that asparagus partners well with: eggs, bacon, butter, cream, cheese, smoked fish, steamed fish, and spring vegetables like new potatoes, peas and broad beans. Keep these handy and you'll never far away from an asparagus dinner to die for.